A name can say it all. At Cosmopawlitan, we are more than a Pet Salon & Boutique; we like to push the limits and treat your pet the way we would like ours to be treated—like they’re part of the family. It's all about personal care, respect and trust when it comes to this experience for your loved ones. That is why we take things a step further, allowing our clients to be in the room the whole time as their loved ones get groomed by one of our trained and certified professional groomers, instead of having to look through a glass window after handing over their pets to a stranger (which can be a stressful situation for any animal). At Cosmopawlitan, we don't stop there. We never cage your pet here and we encourage holistic and organic diets for your loved ones’ health and overall wellbeing. We only carry the best food and products to promote a healthy and happy pet. Upfront. No Hidden Fees. No Extras Charges. We pride ourselves as a Full Service and Open Door Policy groomer, but also offer appointments for those pampered pets of ours that get more attention than others. We have custom packages for lap dogs through those big boys. Exclusive Brands, Custom Products, One of a Kind Service. Come be part of the family at 320 Main Street Islip, between Ocean Ave and Cedar Ave, across from the Post Office. Support and Preserve Long Island's Small Businesses and The Communities that support them. 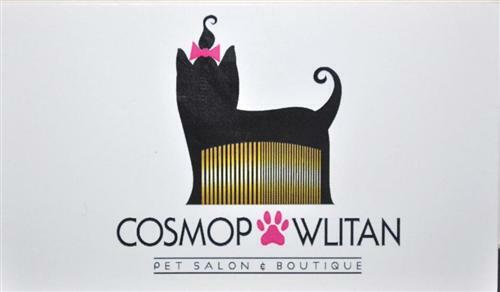 Do you have any experience using Cosmopawlitan Pet Salon & Boutique? If so, please rate your experience and let others hear about it using the form below.